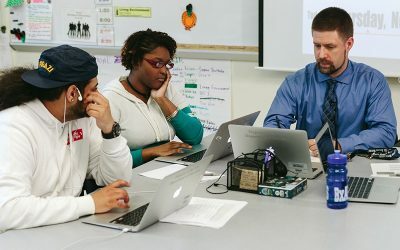 Ninth through twelfth grade implementation of blended and personalized learning in a transfer school (also known as a continuation or alternative school) serving students in an urban setting. Core strategies include students creating Credit Maps, nearly complete student ownership of their own learning, facilitation plans that help individualize instruction, a three-credit focus for each student, and using challenges and capstone projects to demonstrate knowledge and mastery. 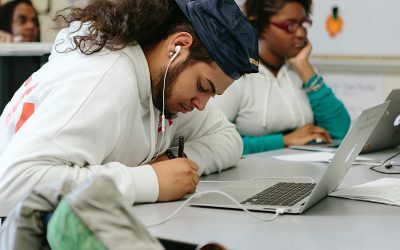 Interesting or unique highlights to check out: long open time blocks called Arenas, productivity guidance with learning tasks and a banking system, and students completing senior portfolios to show readiness for post-graduation endeavors. 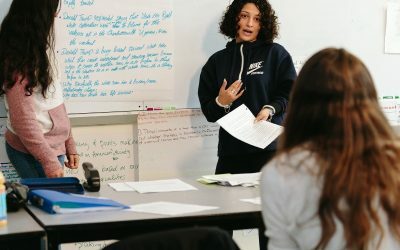 Bronx Arena has implemented large changes to its schedule, staffing, curriculum, and other critical structures to provide the best education possible for its students. The student population not only has a higher sense of urgency (as most have to graduate within two to three years before “aging out”), but many have also experienced deep or continuous traumas in their life. 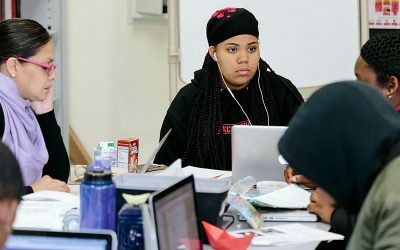 For such a small school, offering traditional coursework to meet all students' credit needs would be nearly impossible, so Bronx Arena built curriculum that students work through at their own pace. The majority of the time they spend in school is in an Arena, a four hour time block in the same room where students can work through their courses with the help of generalist teachers and content specialists. Each Arena is staffed with a generalist teacher and an Advocate Counselor, both of whom get to know the students through long periods of daily interactions over multiple years. Advocate Counselors are provided in partnership with SCO Family of Services and their primary responsibility is to support the social and emotional needs of their students. Creating such a strong network of supports helps Bronx Arena use its resources flexibly, matching them to student needs. This approach accelerates student learning while also promoting non-academic growth. 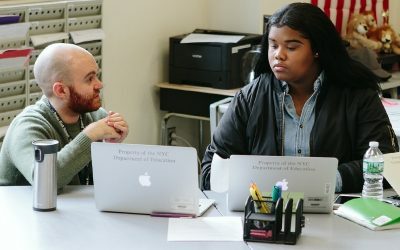 Students at Bronx Arena experience a setting that mixes educational and professional components to help them prepare for life after high school. The primary instructional part of their day is spent in an Arena. Arenas are classrooms with approximately 27 students for each teacher, and students remain in the same Arena until they graduate. 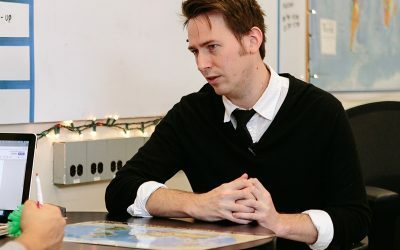 This allows them to build close connections with other students in the Arena, as well with the generalist teacher and Advocate Counselor. Advocate Counselors support the social and emotional needs of each student, and help them with things like attendance, goal-setting, and problem-solving life issues that may affect their time and performance in class. 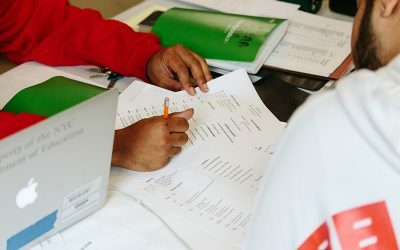 Students work with generalist teachers to create a graduation plan, set academic goals for the year, and choose which coursework they want to work on. Students at Bronx Arena select which courses they want to complete and are responsible for moving through the work at the appropriate pace. Students create Credit Maps that help them determine everything they need to take in order to graduate, and use these to determine the sequence of courses they will take throughout the year. Within an Arena, students will work on a primary and secondary credit on any given day, in addition to earning a Learning Lab credit during the first 90 minutes of school. The secondary credit provides students with another option in case they need to change things up over the four hour block. When they complete a credit, they select a new course and start work immediately. 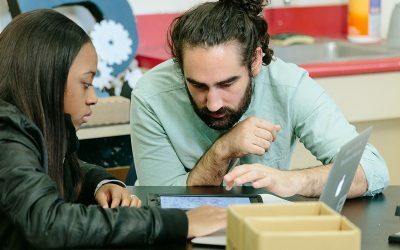 When students need support within these courses, they check-in with their generalist teacher, who may be able to provide guidance or recommend resources. Students also have access to content specialists that provide small group instruction for students struggling with similar concepts (often before students reach a point of frustration). Students also keep track of their productivity and are expected to complete five learning tasks per day, which helps them self-manage by connecting the choices they make with achieving their goals (including graduation). 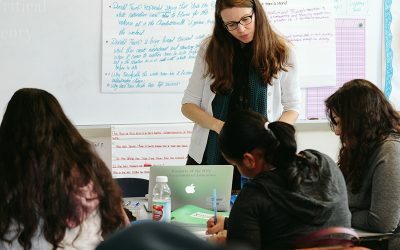 Teachers at Bronx Arena take on many different roles to help create a truly personalized experience for their students. Generalist teachers and Advocate Counselors spend four hours each day with the same students for multiple years. 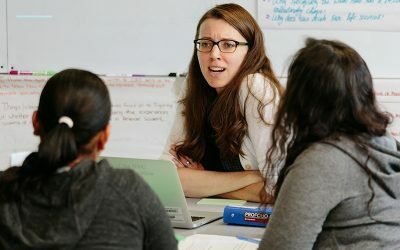 While teachers’ primary responsibility is academic support and Advocate Counselors’ primary responsibility is social and emotional support, these roles begin to blend over time as relationships develop. These educators also work to facilitate a community and family atmosphere within an Arena, creating additional supports for students who may not have all of their needs fulfilled outside of school. Content specialist teachers also work closely with students, encouraging their passions within subject-specific areas of focus. 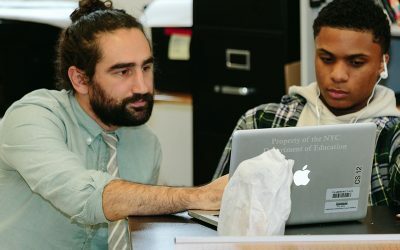 Teachers at Bronx Arena design and implement a custom curriculum that serves as a foundational component to students’ blended learning experiences. Curriculum design teams are composed of educators that create courses relevant to their students’ needs and interests, which are continuously developed over time. 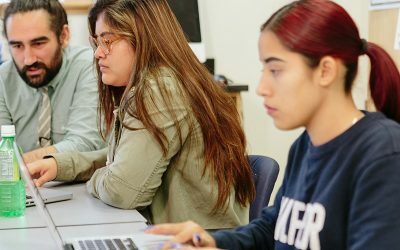 The coursework is crafted so students can move at their own pace, allowing teachers to coordinate individualized academic supports for each student. Helping students develop self-management is also a critical responsibility for educators. 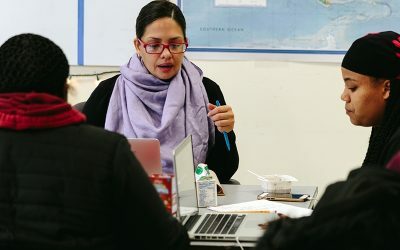 Over a student’s tenure at Bronx Arena, educators help them engage in planning and goal-setting around academics, reflect on their learning, identify their strengths and areas of growth, and track their data. Educators model these practices and, over time, gradually shift the responsibility of leading these processes to the students. 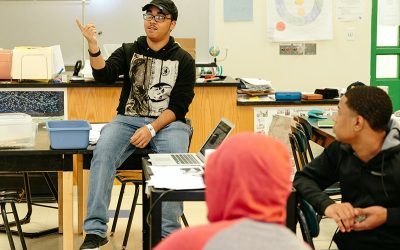 Performing different roles and responsibilities can be challenging for educators but proves worthwhile as they help students attain the academic knowledge and personal skills to be successful after high school. 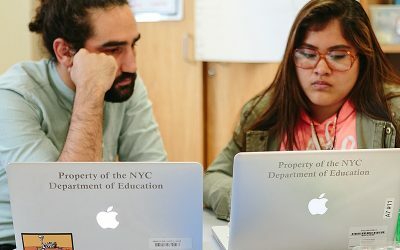 Bronx Arena has created a consistent instructional model where students must complete two challenges and a capstone project to demonstrate competency within a course. Students in each classroom might be working on a variety of different courses, but each course is anchored in this approach, creating a more consistent experience. 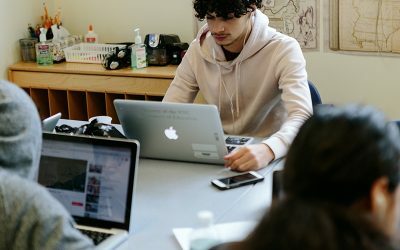 Students are supported by generalist teachers and Advocate Counselors during the majority of their school day and receive support from content specialists as needed. Technology is the backbone of blended learning at Bronx Arena. With an average of 27 students in each classroom, it is crucial to create individualized instruction plans for each student. 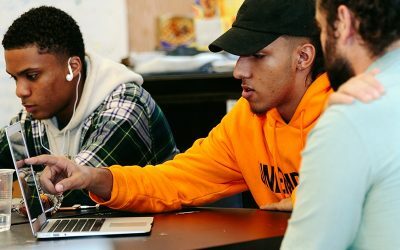 Bronx Arena built a custom learning management system, as well as custom curriculum, to create an environment where every student can work on a different course at the same time. This approach also requires a 1:1 device ratio. Blended learning occurs throughout the entire day at Bronx Arena. Students spend 90 minutes in learning labs and four hours in Arenas each day. Students have choice over their coursework during each of these time blocks and are able to move through the work at their own pace. Data at Bronx Arena is highly transparent and made available to students and staff. 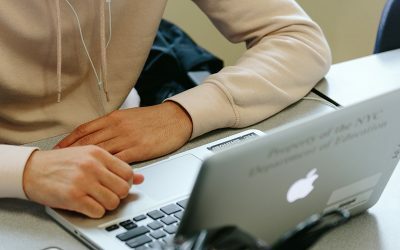 Both can track student progress through courses in the tracker, a custom-built data system, which also shows student attendance and productivity metrics. Transparent data empowers students to own their learning and enables open and honest conversations when students fall short of learning goals. Each student at Bronx Arena has a truly personalized learning experience. 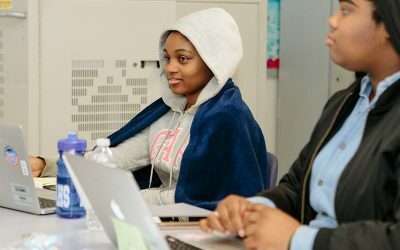 As a transfer school, Bronx Arena welcomes students with a variety of credit needs, pursuing different sequences of courses to meet their graduation requirements. Students also have choice over their particular sequence of courses and are able to change the sequence based on their progress, strengths and weaknesses, and interests – among other reasons. 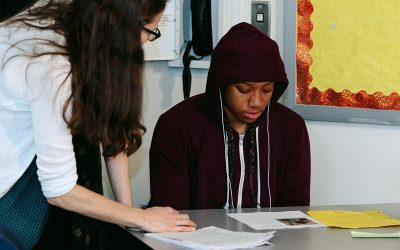 Students receive ongoing academic support from a generalist teacher, social and emotional support from Advocate Counselors, and additional support as needed from subject-specific content specialists. Bronx Arena crafted their own competencies to better organize the academic experience for students. They have high-level competencies, such as analysis and thinking, as well as specific competencies that clearly illustrate how students can demonstrate mastery. Mastery thresholds are highlighted in rubrics for each course and are divided into three different levels: learning, functional, and nuanced. Staffing and Roles: Bronx Arena hires two different types of academic staff: generalists and content specialists. Generalists help facilitate individualized student learning plans and coordinate additional academic supports. Content specialists provide small-group instruction to students in specific subjects such as math and ELA. Bronx Arena also employs Advocate Counselors who provide social and emotional support for students. 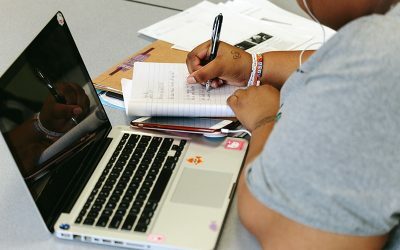 Devices: Bronx Arena’s approach to blended learning requires each student to have his or her own learning device available throughout the school day. Students are also permitted to check out loaner devices if they would like to bring one home to continue their work. Content: Bronx Arena built custom content for each of its courses. This content aligns with its instructional approach requiring students to complete two challenges and a capstone. It also incorporates outside resources from a variety of instructional sites. 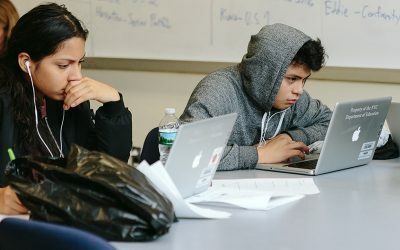 Broadband/Connectivity: In order to successfully complete their work at Bronx Arena, students must have adequate connectivity at all times. Schedule: A daily four-hour time block called an Arena is a core component of Bronx Arena’s instructional approach. Students use this time to work through their individualized coursework. 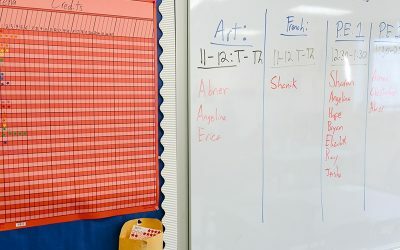 This schedule also creates unique opportunities for interactions between students, or between students and teachers. Budget - Bronx Arena’s academic budget is funded by the NYC Department of Education. 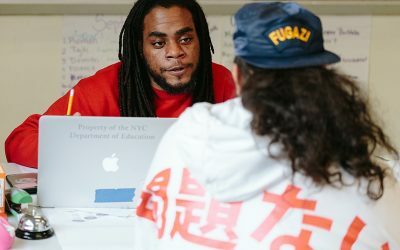 New York City’s Learning to Work program funds part of the Advocate Counselor positions, and SCO Family of Services fundraises the rest. Resource Allocation: Bronx Arena partners with SCO Family of Services to support students’ social and emotional needs. Bronx Arena has continuously refined its instructional approach for several years and will continue to develop this approach in the future. Each year, school officials have incorporated feedback from both teachers and students to improve their instructional model. 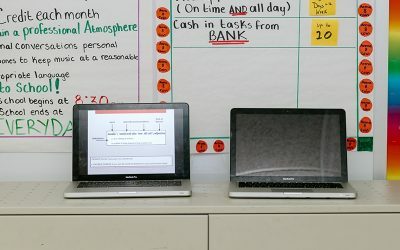 The approach also allows for flexibility in teaching and learning, which encourages students and teachers to try new things and provides school administrators with new data for possible improvements. While the approach requires significant resources, these resources afford critical components that support a high-need student population. Supports for more traditional student populations should typically be less resource-intensive. 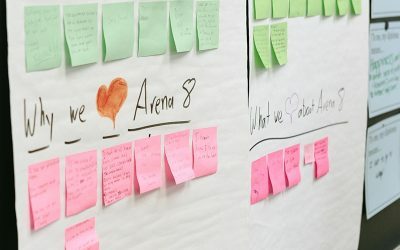 Bronx Arena’s model relies on a custom-built data system and curriculum. They hope to eventually be able to make these components open and available to other schools but currently lack the funding to scale it beyond their school walls. Many of their instructional strategies, however, can be replicated without their custom curriculum and data system.